Ramen joints are anywhere and everywhere these days like here, here, here and here. It’s just one of those comfort foods that you can’t get enough of. While itching for some ramen one evening, I went with a friend to try Saiwaii Ramen, which took over the old SO’s location on Irving. I was moderately impressed with the restaurant, and would definitely come back if I wanted some quick ramen for dinner. Unlike the very popular Izakaya Sozai, we were seated almost immediately. They had some interesting ramen choices on their menu like the Spicy Garlic Tonkatsu Ramen and the Special Ramen with Chicken Kara-age AND pigs feet. I decided to be adventurous (kidding) and try the Tonkatsu Ramen. And then I experienced something that I never thought would happen… I had way too many noodles! The ratio of noodles and broth was completely off. Though I was excited at my ginormous portion, I didn’t have enough broth to go with each bite. The ramen had the usual fixings – bamboo shoots, spinach, seaweed, char-siu, and wood ear fungus. The ramen was fairly plain and basic. You can order additional toppings such as pork belly, egg, corn – each at a price. The broth was creamy and flavorful, but I’d say it’s lighter than other ramen places. Noticeably absent from their assortment of condiments was grated garlic. Too bad because I love adding that stuff into my ramen. I wouldn’t say Saiwaii had the best ramen I’ve ever had. It wasn’t bad, but it wasn’t amazing either. I think it’s sufficient to settle a ramen craving. 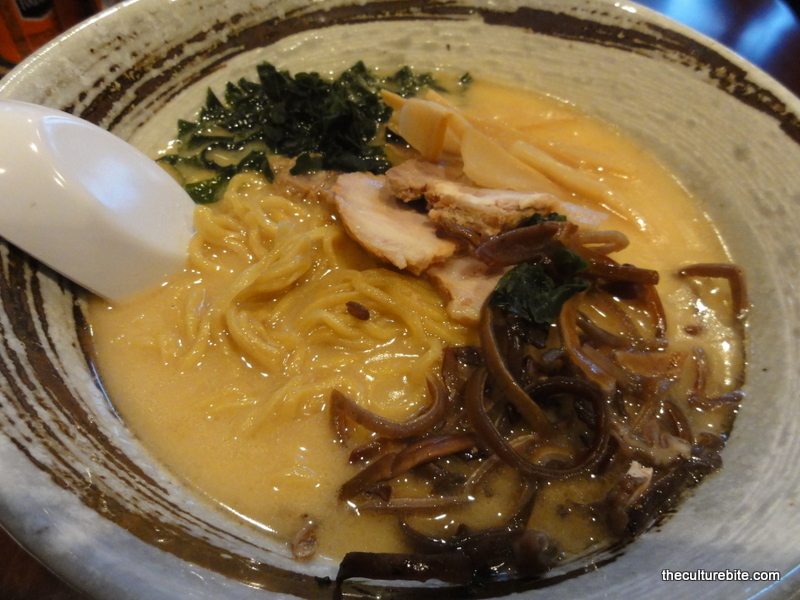 The broth is flavorful, noodles are at a good consistency and portions are large. At $7.95 a bowl, I was stuffed without having to order any side dishes. If you’re in the mood for ramen and can’t get into Izakaya Sozai (also on Irving), try this place out. « I Met Alice Waters!